In the past Lovering Volvo has relied largely on bigger outsourced IT vendors for most of its technology needs and support. With technology constantly changing and reliable and personalized support offerings being expected, it was time to carefully select a new IT partner that could properly design, implement and support an enterprise-class wireless solution. This is a critical time in the WiFi world for dealerships. Customers demand state of the art amenities such as wireless. With cars now being shipped with built-in WiFi and strict guidelines being required by the auto manufacturers it was good timing to choose a reliable partner in technology to meet their wireless needs. One that listens to the customers’ goals and meets the strict guidelines being required by the auto manufacturers all while considering cost and budget. In order to properly service these next generation vehicles a high level of performance and reliability in the wireless design is mandatory. Lovering Volvo had consumer-grade access points in place. They wanted to bring the entire company under one network architecture and vision, with advanced enterprise features. Having a centralized management offering was critical. Company goals were to offer greater wireless service to its customers, as well as integrate a wireless network for its employees and business operations. A comprehensive enterprise-class wireless solution was required. Auto dealerships function much like any large corporation with strict guidelines on specifications, performance and security. These areas of concern were paramount. The existing Wi-Fi did not provide protection and the level of security mandated by Volvo for the company to protect its customers and large amounts of sensitive and confidential data. The company goal was to bring corporate level standards to its wireless network without complexity. A robust, secure and scalable, yet simple solution that enabled a single person to manage and support it from anywhere at any time was crucial. Lovering considered several vendors for its wireless solution but chose Morse based on their experience, design expertise, creative offerings, proactive support model and passion for customer satisfaction. Other companies did not demonstrate the drive and determination in providing a customized solution to meet the needs of Lovering Volvo and the Corporate Volvo requirements. Morse offered several different wireless offerings including Cisco Meraki and Ubiquiti and ultimately agreed on the Ubiquiti solution. Ubiquiti’s provisioning features enable us to configure new APs and ship to any location with simple plug and play installation. Lovering uses the Unifi virtual controller and has found the partnership and support through Morse perfect for their day to day support and future needs. The network is set up for corporate and guest network access, with scheduled airtime for both guests and corporate users, as well as captive web portal to welcome guests to the network at all dealership locations. Since much of the network use is by guests, it was key that the guest network could operate side by side the corporate network, without requiring complex firewall policies. Lovering Volvo is committed to the best possible employee and customer experience in all locations. Additionally, based on the Volvo corporate requirements, they needed not only a secure and reliable wireless solution but also one that offers customers seamless connectivity. Being a sales-driven organization our team had a strong need for solid performance as a common tool to selling cars these days is leveraging phones and tablets to display videos. Auto dealerships rely heavily on DMS software, and Lovering uses a solution from vendor ADP, which can now be accessed via mobile and tablet devices. Now when customers enter service areas at Lovering, a technician can walk around the vehicle and start writing the service ticket on a mobile device even before they enter a waiting area. Employees could then retrieve checklists for individual vehicles straight from tablet devices, and make additional service appointments via iPads or other mobile devices. Employees are no longer tied to desks but can use mobile devices and SIP phones to better assist customers in show rooms and in car lots. Access points have been placed outdoors and can be used for tent sales and other special events. The service department now has the ability to use mobile devices and laptops to work seamlessly with the third-party on-board diagnostic devices. Technicians can now operate diagnostic testing without requirements of cables or being tethered to work benches. Lovering Volvo continuously strives to improve customer amenities at all locations. By improving wireless coverage and reliability they can now become creative in their service offerings and amenities. For example, tablets could be provided for customers to access online music, watch movies or access email or other personal accounts via Wi-Fi. There is the potential to stream content over TVs in waiting areas including infomercials and advertisements targeted to customers. Sales personnel can broadcast next generation vehicles. There are many ways to get creative without the limitations of wired networks. 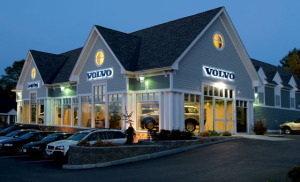 While Lovering is at the top of its game for providing superior sales and service to its customers, and is one of the top dealership groups in NH, it recognized the need and benefit of a robust wireless network. With Morse, Lovering now leverages a comprehensive wireless architecture that can easily expand and grow with the company, bringing each of its separate dealerships under one company vision. The structure of the wireless design we implemented enables Lovering to offer flexibility of features and capabilities for each dealership location, depending on requirements and needs. The guest experience is now significantly improved and Lovering looks forward to taking advantage of further service offerings by Morse.